In this video, Dr. Huntoon discusses what leads to asthma and what you need to consider. Medication can sometimes seem like the right answer, except when it creates other problems. Wouldn't getting rid of the CAUSE be more beneficial? Especially if there are no side-effects associated with the treatment? Watch the video and give us a call if you'd like to get off the medications and start to live drug-free without having asthma. Asthma is a disorder that causes the airways of the lungs to swell and narrow, leading to wheezing, shortness of breath, chest tightness, and coughing. Most people with asthma have attacks separated by symptom-free periods. Some people have long-term shortness of breath with episodes of increased shortness of breath. Either wheezing or a cough may be the main symptom. Asthma attacks can last for minutes to days and can become dangerous if the airflow is severely restricted. Asthma is caused by inflammation in the airways. This inflammation can be caused by airborne allergens included in the list below. When an asthma attack occurs, the muscles surrounding the airways become tight and the lining of the air passages swells. This reduces the amount of air that can pass by. In certain people, asthma symptoms can be triggered by breathing in allergy-causing substances (called allergens or triggers). Aspirin and other nonsteroidal anti-inflammatory drugs (NSAIDs) can provoke asthma in some patients. Read Dr. Huntoon's Alternative Medical Treatment Options below to continue understanding the CAUSE of Asthma. Medical treatments are used by most people when suffering from asthma. As with all medication, certain side-effects are known and others are not known. It is important to consider the side-effects and to do some research into the medication being prescribed to determine if the side-effects are worse than the symptoms associated with your asthma. Control drugs for asthma control your symptoms if you don't have mild asthma. You must take them every day for them to work. Take them even when you feel okay. Inhaled corticosteroids (such as Asmanex, Alvesco, Qvar AeroBid, Flovent, Pulmicort) prevent symptoms by helping to keep your airways from swelling up. Do not take long-acting beta-agonist inhaler drugs alone. These drugs are almost always used together with an inhaled steroid drug. It may be easier to use an inhaler that contains both drugs. Quick-relief drugs work fast to control asthma symptoms, you take them when you are coughing, wheezing, having trouble breathing, or having an asthma attack. They are also called "rescue" drugs. They also can be used just before exercising to help prevent asthma symptoms that are caused by exercise. The goal of medical treatment is to avoid the substances that trigger your symptoms and control airway inflammation. This can and does make life nearly impossible and very limiting for the individual and perhaps their family members as well. You and your doctor should work together as a team to develop and carry out a plan for eliminating asthma triggers and monitoring symptoms. It also does not address the actual cause of asthma. Dr. Huntoon has spent many hours understanding the mechanism that leads to an asthma attack. By addressing the underlying Mechanisms of CAUSE(S) associated with YOUR Asthma, Dr. Huntoon has enabled hundreds of patients to never have this condition again. Don't you want these RESULTS? A growing body of research has linked leaky gut to a number of “seemingly unrelated” health concerns and chronic diseases. As more Americans are affected by poor diet choices, chronic stress, toxic overload and bacterial imbalance, in addition to the Digestive System Disruptors, it appears that the prevalence of leaky gut has reached epidemic proportions. The medical profession is just now agreeing this condition even exists! And your medical doctor may not be willing to acknowledge it. This is the most important thing for you to realize. This last point is especially shocking because “intestinal permeability” has been discussed in the medical literature for over 100 years! And yet they do not acknowledge the existence of this condition since most of what causes it is due to prescription medication. You would be surprised at how many health conditions result from having a leaky gut. The father of modern medicine Hippocrates said “All disease begins in the Gut” and research is now proven he was absolutely right. Essentially, Leaky Gut Syndrome (“intestinal hyperpermeability”) is a condition that happens as a consequence of intestinal tight junction malfunction, secondarily to exposure to the Digestive System Disruptors, including antibiotics, over-the-counter medications, prescription medications, alcohol, stress, food additives, food preservatives and the ingestion of refined and processed sugar. All of this will lead to problems in your microbiota which creates the basis for Leaky Gut Syndrome. These “tight junctions” are the gateway between your intestines and what is allowed to pass into the bloodstream. Your tight junctions keep things out like toxins, microbes, and undigested food particles. But having leaky gut is essentially like having the gates broken from your intestines to your bloodstream so many of these particles that should never have been able to enter have now gotten through. When this happens it causes inflammation throughout your body leading to a variety of diseases. Associated with this condition is the counterpart to the Large Intestine, the Lungs, and Skin. The relationship, as given to us by the Chinese 5 Elements of Health Theory, has proven to be true for over 7000 years. When one has the digestive Yeast/Candida imbalance, with the consumption of dairy, each area, (the Large Intestine, the Lungs, and the Skin), will begin to have issues with excess mucus that affects the permeability within each of these “filters” of the body. Excess mucus in the lungs is the associated cause when dealing with Asthma. Working with a Holistic Chiropractor, who has experience with eliminating the allergic response using specific techniques like NAET, NET, NMT or TBM has proven to be an effective elimination of the allergic response, essentially being a true cure. Adjusting the areas of the spine with Chiropractic Manipulation that help to control the respiratory function to remove any interference within the Nervous System is also part of the solution. You and your Holistic Chiropractor can determine the appropriate solution together. For information on treating asthma in children, see My Child's Health Asthma. Having this condition is not fun at all. Being motivated to look for non-conventional forms of treatment is natural. Working with a Holistic Chiropractor will offer benefits, as using a well-rounded, multifaceted approach to address all the causes and imbalances within the person. This has demonstrated positive results when sticking to a specific treatment plan that results in a cure for asthma. Others have benefited by using Acupuncture, Homeopathy or Naturopathy when following the treatment guidelines set up by your practitioner and you. Discussing what is involved and the time commitment necessary to have a full recovery is warranted. Call for an appointment with your healthcare provider if asthma symptoms develop. Allergy testing may be helpful to identify allergens in people with persistent asthma. The doctor will use a stethoscope to listen to the lungs. Asthma-related sounds may be heard. However, lung sounds are usually normal between asthma episodes. 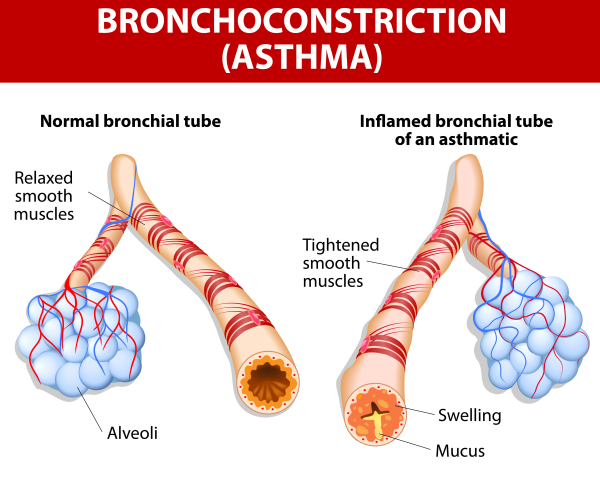 Short-acting bronchodilators (inhalers), such as Proventil, Ventolin, and Xopenex Your doctor might prescribe oral steroids (corticosteroids) when you have an asthma attack that is not going away. These are medicines that you take by mouth as pills, capsules, or liquid. Plan ahead. Make sure you do not run out of these medications. A severe asthma attack requires a check-up by a doctor. You may also need a hospital stay, oxygen, breathing assistance, and medications given through a vein (IV). Keep the phone number of your child's doctor or nurse with you. Children with asthma need a lot of support at school. They may need help from school staff to keep their asthma under control and to be able to do school activities. It can help you see if an attack is coming, sometimes even before any symptoms appear. Peak flow measurements can help show when medication is needed, or other action needs to be taken. Peak flow values of 50% - 80% of a specific person's best results are a sign of a moderate asthma attack, while values below 50% are a sign of a severe attack. There is no cure for asthma from a medical perspective, although symptoms sometimes improve over time. With proper self management and medical treatment, most people with asthma can lead normal lives. Being mindful of the side-effects associated with your medical treatment is important. Discussing alternative forms of care that have no side-effects is important to consider. Dr. Huntoon has spent many hours understanding the mechanism that leads to an asthma attack. By addressing the underlying CAUSE(S) associated with YOUR Asthma, Dr. Huntoon has enabled hundreds of patients to never have this condition again. Don't you want these RESULTS? Working with a Holistic Chiropractor, Acupuncturist, Homeopath or Naturopath, natural solutions to asthma can be instituted and the person can recover from asthma fully. This requires a commitment to the care necessary to restore normal function within the person’s respiratory system and within their body to allow for full recovery. Cover bedding with "allergy-proof" casings to reduce exposure to dust mites. Keep the house clean and keep food in containers and out of bedrooms -- this helps reduce the possibility of cockroaches, which can trigger asthma attacks in some people. Eliminate tobacco smoke from the home. This is the single most important thing a family can do to help a child with asthma. Smoking outside the house is not enough. Family members and visitors who smoke outside carry smoke residue inside on their clothes and hair -- this can trigger asthma symptoms. Dr. Huntoon has experience with eliminating the allergic response using specific techniques like NAET, NET, NMT or TBM. This has proven to be an effective elimination of the allergic response, thus being a true cure. Adjusting the areas of the spine with Chiropractic Manipulation that help to control the respiratory function to remove any interference within the Nervous System is also part of the solution. You and your Holistic Chiropractor can determine the appropriate solution together. Working with a Holistic Chiropractor who takes a well-rounded approach to discover and correcting all your known and unknown triggers, is warranted. By working with you to improve the functioning of your respiratory system and strengthening your immune system will greatly reduce the incidences of asthma and will eliminate asthma altogether. Developing a healthy lifestyle with proper guidance from your Holistic Chiropractor is the best prevention when considering how to approach your health.